equipped for your private mountain getaway vacation. 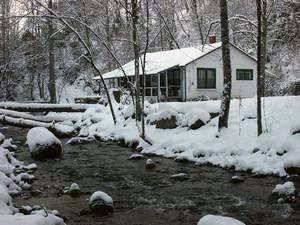 Cabin sits along the bank of a stocked Trout Creek. No fishing license required. Nothing is more spectacular then the Great Smoky Mountains covered with fresh snow. 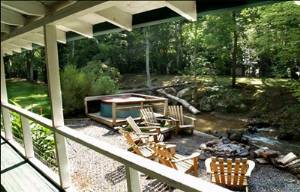 Relax in your own Romantic hot tub overlooking the rushing creek. I have stayed in most all of the Hidden Creek properties and they are all top-notch. The owners are so accomodating and friendly and the location is so private and secluded, with the quiet of the forest broken only by the sound of the rushing creek right in the front yard. 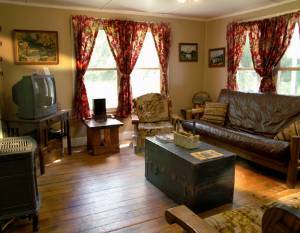 The farm house is rustic and comfortable. I have stayed there so much that is seems like home to me. 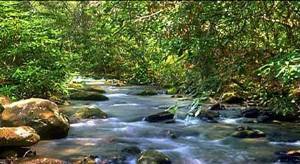 I have stayed in many other properties in and around Bryson City and they were all very nice. The farm house is just special, however. 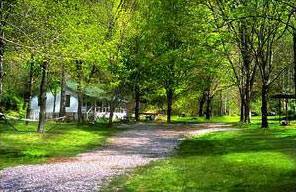 I highly recommend all the Hidden Creek rentals, especially the farm house. Rates start at $100 per night and $650 per week depending on time of year and number of guests. Other Fees: Pet cleaning fee $45.